Some time ago, Neuroecology asked people in the twitterverse what the biggest questions in their field are. While I'm no longer working on taste, these are the three big questions to my mind. Take these with a rock of salt, as I'm not 100% up to date on the literature, and these are just my opinion. 0. To what extent, and where, is taste a labeled line system versus a combinatoric one? I personally think the evidence right now is that there are labeled lines in the periphery which combine in the central nervous system, probably near the NTS. But the three questions below are aimed at answering this overarching question in the periphery and cortex. 1. What in God's name is going on in the taste bud? Due to the work of Zuker, Margolskee, and others, we have identified the basic taste receptors and the cells that express those receptors. To wit, there are GPCR expressing cells ("type II") that are responsible for sweet, umami, and bitter; sour seems to be detected by PKD channels in presynaptic "type III" cells; and salty seems to be detected by ENaCs on glial-like "type I" cells. Simple enough, yes? None of these cells form conventional synapses. 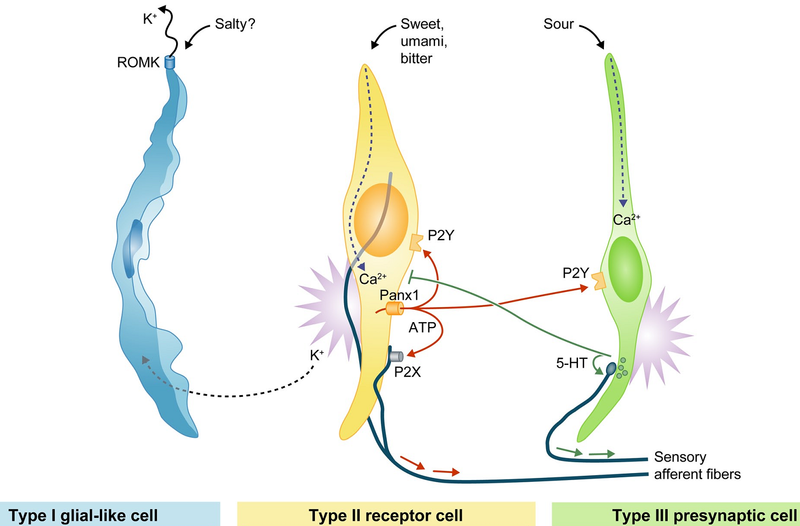 The three main types of taste receptor cells in the taste bud. Note that none of the cells forms a canonical synapse with afferent fibres. I believe the figure above is accurate and reflects the current understanding of connections in the taste bud. Glial-like cells do not appear to have direct connections with other cells in the taste bud, and may signal via glia-like mechanisms. Receptor cells are wrapped by afferent nerves, but do not form synapses with the nerves. Rather, they appear to release ATP which activates the fibres. And pre-synaptic cells do indeed form synapses, but it's not clear whether they actually synapse directly onto the afferent fibres. There is also some cross-talk between the receptor and pre-synaptic cells in the form of serotonin and P2Y. How the cells in the taste bud interact with each other and send information to the central nervous system will have fundamental implications on question zero. If the cells are talking to each other in the taste bud, it means the labeled lines are not independent at the first step. And, well, knowing how your sensation is transduced is fundamentally important. 2. Is bitter a single labeled line? "the demonstration that different mixtures of 2 or 5 probes detected as many positive cells as the mix of 10 suggests that each positive cell expresses nearly the full complement of T2Rs. If we assume that each receptor signals via the same pathway, and that the patterns of receptor expression delineate the logic of taste coding, these results indicate that there be limited functional discrimination between T2R-positive cells." If this were true, one would hypothesize that our discrimination between foods comes from olfaction. The next year the Roper lab (Caicedo and Roper, 2001) performed calcium imaging on taste buds from intact tongues, blind to cell type. They applied five different bitter compounds, at varying concentrations, and found that individual cells responded to only a subset of the different bitters. In other words, single cells were able to discriminate between different bitter compounds, which would imply each cell has a different complement of bitter receptors. This sort of result has been found in recordings from the NTS and PBN. Receptive field of different taste cells (y-axis) to five different bitters (x-axis). 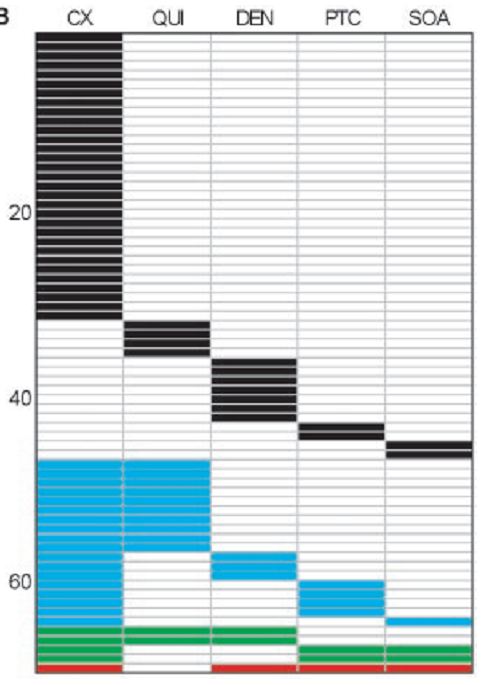 Many cells respond primarily to one bitter compound (black blocks), while some cells respond to two or more bitters (blue, green, and red blocks). Over the last decade, the Meyerhof lab has been investigating bitter receptors, and has performed two different tests that indicate bitter taste cells only express a subset of T2Rs. In Behrens et. al., 2007, they performed in-situ experiments similar to Adler, and found that going from one bitter receptor probe to two probes roughly doubled the number of labeled bitter cells. In Voigt et. al., 2012, they generated T2R131-GFP, and found that GFP only labeled ~50% of the gustducin-labelled bitter cells (gustducin is a common downstream messenger of the bitter GPCRs). At this point, I would normally write off the bitter-is-a-single-line theory as Zuker being Zuker. Except bitter discrimination behaviour supports the idea. To test bitter discrimination, experimenters first normalize the bitterness by choosing concentrations that elicit similar aversion for each bitter. Then they ask animals to discriminate between these two bitter compounds. In both flies (Masek and Scott, 2010) and rats (Spector and Kopka, 2002), the subjects fail to discriminate between equally aversive bitters, supporting the idea that there is a single bitter labeled line. Rats discriminating between two tastes. Rats are able to discriminate bitters (Qui: quinine; Den: denatonium) from salts (NaCl and KCl). However, when asked to discriminate between two bitters (final testing sessions), the rats are not able to discriminate. From Spector and Kopka, 2002. These experiments are not completely clean to my mind. One might imagine that there are two ranges of bitter tastes: at high concentrations, bitters taste bad and are aversive; and at lower concentrations, bitter tastes may be less aversive, and more informative. By testing at aversive concentrations, they may be saturating receptors, and not be in the discriminatory range. These experiments, of course, are hard to design. Personally, I lean towards the idea that bitter is a multi-lined label. The physiology is straightforward. Humans who are anosmic are still able to discriminate between tastes. Yet no one has demonstrated convincing behaviour that bitters can be discriminated without olfaction. 3. How do cortical neurons respond to mixtures of tastes? And mixtures of taste and smell for that matter? When you eat a hamburger, you don't just taste sweet ketchup, umami meat, and sour pickles; the different taste lines merge together, and combine with the smell of the toasted bun, and non-taste oral cues like the temperature and texture of the ground meat, to form a whole. Which is a long way of saying that while "taste" is a single sense, flavour involves multisensory integration. Unlike the previous two questions, there really isn't that much to talk about in terms of past research. A couple papers have looked at how binary mixtures are represented in the brainstem and cortex, but they've all been (rightfully) published in "specialty" journals. It is a difficult question to study: done well, one would want to record many neurons' responses to large numbers of mixtures. Hopefully someone can manage it sometime soon. Adler, E., Hoon, M. a, Mueller, K. L., Chandrashekar, J., Ryba, N. J. P., & Zuker, C. S. (2000). A novel family of mammalian taste receptors. Cell, 100(6), 693–702. Spector, A. C., & Kopka, S. L. (2002). Rats fail to discriminate quinine from denatonium: implications for the neural coding of bitter-tasting compounds. The Journal of Neuroscience, 22(5), 1937–41. Interesting post Mike. I wonder, if you're on board that gustatory cells can respond to more than one basic taste, and can talk about different 'bitters', with cells responding to only certain chemicals within a basic taste category, do you think that there is any reason to stick with the basic taste terminology? Why not just talk about receptors/neurons responding to different chemicals, like in olfaction? Hmm, interesting question. I should clarify that the five major lines do appear segregated between different receptor cells in the bud. For these basic tastes, we have clear connections between human cognitive percepts and the receptor. So I think it's more informative to call them "sweet" cells rather than "sucrose" cells since so many sweet things like sucralose or fructose activate sweet cells. For the bitter receptors and cells, I could see an argument. Denatonium doesn't taste like anything but straight bitterness (if you want to taste it, I suggest starting at low concentrations like 10uM, because that taste lingers). But if say, certain subsets of bitter receptors were commonly coexpressed (rather than stochastic expression), then it might be useful to call taste cells or receptors "denatonium" or "cucumber" cells. Or I could be completely wrong, and even at low concentrations, bitter ligands taste purely "bitter," and have no discriminatory role.